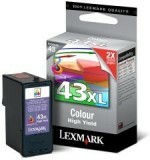 The Lexmark 43XL color print cartridge contains evercolorâ„¢2 ink; its unique pigment based formulation combines exceptional resilience with improved archivability. The unique pigment based formulation of evercolorâ„¢2 ink combines exceptional resilience with improved archivability. When evercolorâ„¢2 ink is printed on Lexmark PerfectFinishâ„¢ photo paper, photos can last up to 100 years in normal display conditions or stored in albums. From presentations to special occasion photos, evercolorâ„¢2 ink achieves vibrant, resilient results. Compatibilities: X9350, X9350 Business Edition, X4850, X7550, X6570, X9575, X6575, X4875, X4975, X7675, X4950, X4975ve, P350, Z1520.